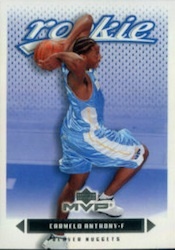 Carmelo Anthony was part of the loaded 2003 rookie class that also included Dwyane Wade and LeBron James. 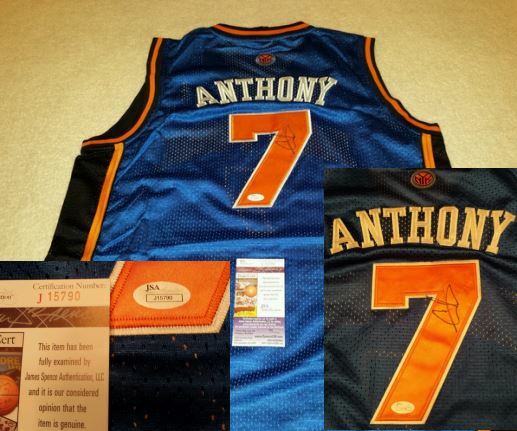 A change of scenery from Denver to New York should do wonders for values of Carmelo Anthony cards and memorabilia based on the Knicks' strong hobby appeal. Being paired with another elite player in Amar'e Stoudemire doesn't hurt either. Although his impending move was a regular topic in the NBA news during the 2010-11 season, Anthony did not face the same backlash James experienced when he left Cleveland for Miami. Now that Anthony has settled in with the Knicks, expectations will continue to build and the scrutiny will be intense. Carmelo Anthony card values are below those of both Wade and James. 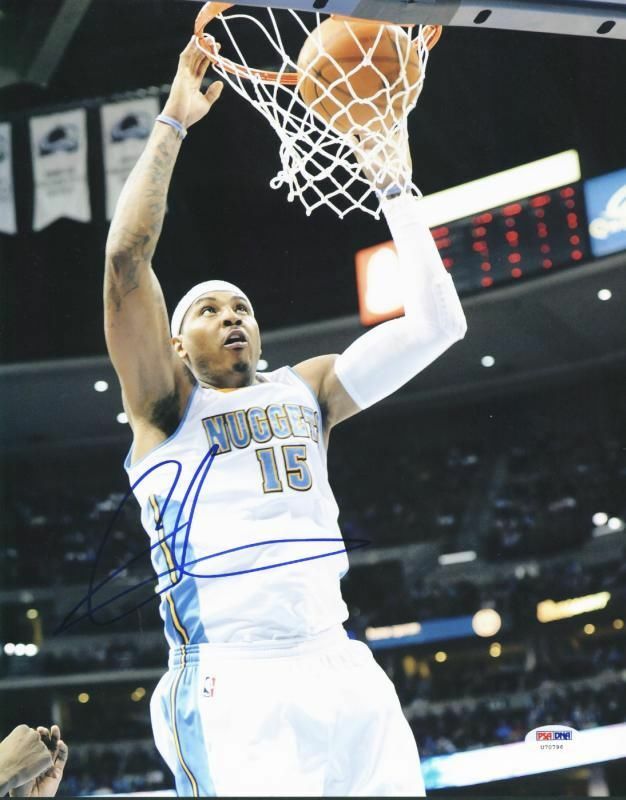 However, with a strong postseason showing in New York, Carmelo Anthony card values could see a significant jump. 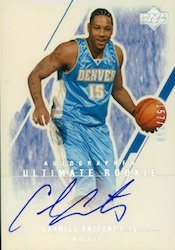 Carmelo Anthony has over 60 true rookie cards that range in price from a couple of dollars to much more. On-card autographs are on both of Anthony's top cards. One of the most sought after and valuable sets ever, 2003-04 Upper Deck Exquisite features autographed jersey rookie cards for LeBron, Carmelo and Dwyane. 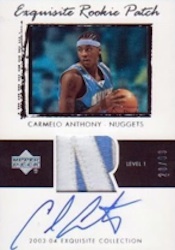 Even as the third best option in the product, the Carmelo Anthony card is still very valuable based on the combination of a low print run, compelling jersey patch and autograph. These do not surface very often. 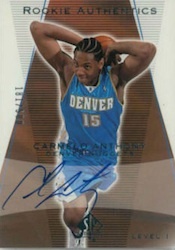 The Carmelo Anthony card from 2003-04 Ultimate Collection offers a nice on-card autograph. It's also very reasonably priced compared to the Exquisite card. Although it has no jersey patch, the card still has a lower pint run than most of Anthony's other rookies and features a good design with crisp colors. 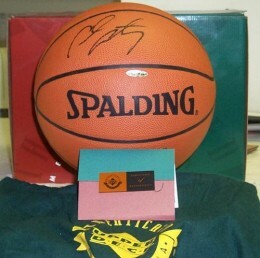 2003 - 04 Ultra Gold Medallion "Lucky 13" CARMELO ANTHONY RC!!! WOW!!!!! 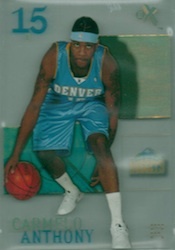 2003-04 Upper Deck Lebron James Rookie Card with Carmelo Anthony (Graded 10)!!! 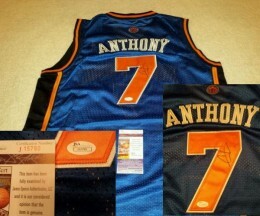 Below you will find an example of what Carmelo Anthony's authentic signature looks like. This can be used as a first point of reference for determining the legitimacy of autograph memorabilia, but is not a substitute for having your items authenticated by a well-respected professional autograph authentication company. Reputable authentication companies include JSA, PSA, Panini Authentic, Upper Deck Authentic, Tristar and Mounted Memories to name a few. Click on any of the images below to view full size photos. The whole signature is written on a level horizontal plane with a distinct lean to the right. In the first name only the letters "C and l" are legible with the others being implied. The pen lifts to start the last name which consists of the letter "A-t-y", again, the rest are implied. The letter "A" is represented as a very long and narrow oval. The letter "t" is always crossed. The letter "y" flows out of the letter "t" and finishes the signature. Hoping you can help. I have a 2004 upper deck s-class signature card of Carmelo Anthony. It isn’t listed in any Beckett price guide, nor have I seen one on e-bay. I’m presuming it might be a rare card. Is there anyway you might be able to find out how many of these he might’ve signed, approx. value etc… or guide me to where I might be able to find those answers. I’ll thank you in advance for reading this, and for any help you might provide. Sincerely- Dave T.